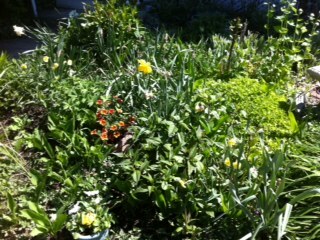 oh the greens of spring!!! much as i adore flowers it is the bright fresh greens of the gardens that really make me swoon. crisp little shoots, soft curly leaves and the vibrant branches of the trees. it is all just SO alive!!! 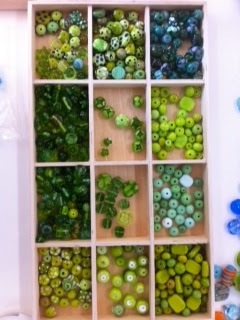 i have these lovely new bead organizer trays for the studio. for the past couple of days i’ve been listening to a great audio book (Half-broke horses by Jeannette Walls) and organizing by colour. right now my favourite is the greens. because of spring. how long do you think these trays will be so nicely organized? i give them a week.